Lamu Island is listed as a World Heritage Site by UNESCO. It is a beautiful place boasting medieval architecture and is known as the home of Swahili culture. Lamu Island is part of the Lamu Archipelago in Kenya and was built historically by Arab traders as a trade route. Some estimations put its age at around one thousand years! 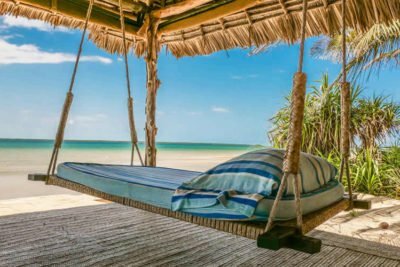 Lamu Island is also known as Kenya’s oldest town, and a place with roads so narrow that cars can’t even traverse them, so transport is idyllically done through boats, donkeys and – bicycles and motor bikes are of course absolutely welcome! All these three hotels offer breathtaking views of the coastline, as well as easy access to the beach. There are concierges available to help make your stay as simple and seamless as possible. Friendly kitchen staff will provide excellent menus including personally prepared seafood, freshly caught by local fishermen. A good number of Lamu island hotels also provide fast Wi-Fi and internet service. Sailing, jet skis and other water sports are also available. Shela Village is located practically a stone’s throw away from Lamu Town. 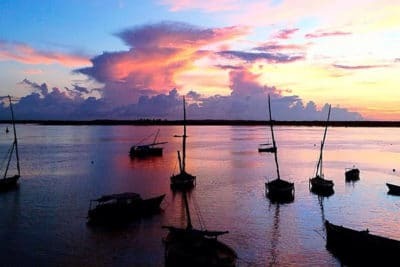 From a torrid history that saw its defeat by Lamu in 1813, the village is known primarily for its pristine white beaches that offer splendid views of Lamu Island. It is well known as a place where celebrities own many houses along the shoreline which they have converted into guest houses. The village is also popular with expats and tourists who can often be seen buying trinkets and other items at the various market stalls. Donkey-carts are very popular in the village as a mode of transport. If you are looking for a more quiet Lamu Holiday, Shela Lamu is the place to be. You will however not escape interactions with the native people of the village but every one here minds their own business. There are a number scheduled flights from Nairobi to Lamu Island daily. Most of these flights depart from Wilson Airport and 2 from the Jomo Kenyatta International Airport. The distance from Nairobi to Lamu Island is 345 miles and takes 1 hr 45 mins for direct flights and 2.30 hours for connecting flights. There are shorter wait times for flights at Wilson Airport as compared to Jomo Kenyatta International Airport, due to it being a less busy airport with fewer flights and passengers daily. The flights land on Manda Airport, which is a small airport servicing flights that arrive from Nairobi. Passengers arriving at Lamu Airport will require a boat to cross over onto the Lamu Island or the Lamu hotels. 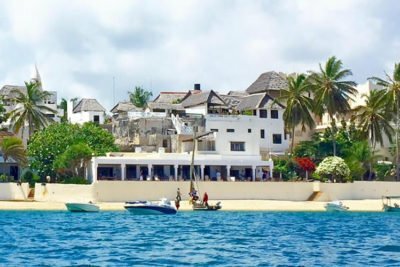 Lamu boasts a lot of activities to engage in and sights to visit. Being a many-centuries-old town, the town boasts Swahili architecture and relics. The Lamu Museum holds some very interesting and curious pieces of art and sculpture. Siyu Fort is another interesting place to visit as it exudes some of the charm and tenacity of Island in its heyday as a route for trading. Don’t miss out on the evening traditional Dhow cruises a must do activity in Lamu. Watersports are plentiful in Lamu, with many companies offering skiing, sailing, and swimming in the refreshing waters. Or perhaps a simple sunset walk on the magnificent beaches should be enough.